Median is the mean of 13th and 14th observations. Both of these observations lie in the cumulative frequency 14, for which the corresponding observation is 7. The class interval containing the or 25th item is 20 â€“ 30. Therefore, 20 â€“ 30 is the median class. The mean and standard deviation of six observations are 8 and 4, respectively. 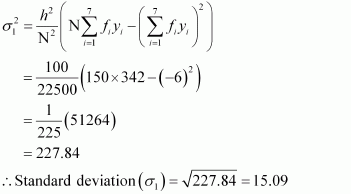 If each observation is multiplied by 3, find the new mean and new standard deviation of the resulting observations. Given that is the mean and σ2 is the variance of n observations x1, x2 … xn. Prove that the mean and variance of the observations ax1, ax2, ax3 …axn are and a2 σ2, respectively (a ≠ 0). The given n observations are x1, x2 … xn. Therefore, mean of the observations, ax1, ax2 … axn, is . Thus, the variance of the observations, ax1, ax2 … axn, is a2 σ2. The coefficient of variation (C.V.) is given by .